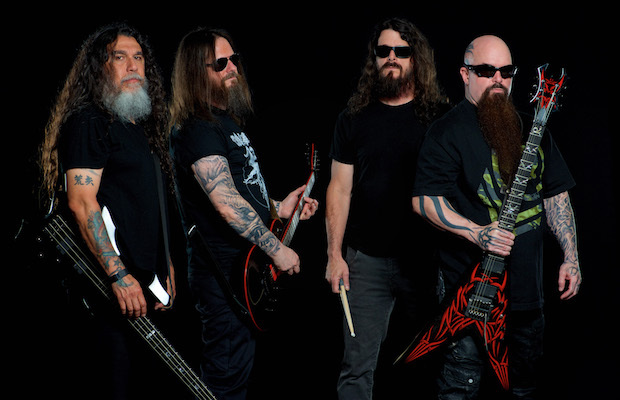 In support of their uncontainable, brutal 12th album and first since the passing of guitarist Jeff Hanneman, Repentless, thrash metal pioneers Slayer, counted among the “Big Four” who helped define and popularize the sound decades ago, have announced their first Nashville show in almost 20 years, this year’s Bonnaroo outing notwithstanding, Feb. 22 at War Memorial Auditorium. Supporting them are similar-minded metal mavens Testament and Carcass, and tickets are set to go on sale Friday, Dec. 11 at 10 a.m. CST here (some very special VIP tickets are available now using the promo code “noiseyslayer”). Another member of the Big Four, Anthrax, recently announced a Marathon Music Works show; your move, Metallica and Megadeth.